There’s something for everyone going on this weekend! An opera, the Bacon Bash, Robert Alvey as Mark Twain? Grab a friend and enjoy some of these events. Saturday, Sunday and repeating every day through April 3rd. Enjoy the Arcade Age at the Cradle of Aviation Museum in Garden City. Explore the short history of video arcade games through exhibitry and game play. With three daily sessions available (11:30am, 1:30pm and 3:30pm) your 90 minute free play, timed-ticket for the Arcade Age exhibit also includes full access to the Cradle of Aviation galleries. For the 3:30pm session, arrive early to enjoy the galleries as they close promptly at 5pm. Saturday and Sunday- The Hofstra Opera Theater will be performing Jacques Offenbach’s La Vie Parisienne (Parisian Life), a comic operetta famous for its exuberance and hilarious social satire. A parody of high-society life in Paris, La Vie Parisienne pokes fun at the rich and revels in the wit of their servants. John Cranford Adams Playhouse, South Campus. 7:30pm, Sunday 3:00pm. $15, $12 seniors. Tickets may be purchased at the door if available or you can buy them online by clicking here. Hofstra University, Uniondale. Saturday- The Tilles Center hosts Orchestre National de France at 8pm in Concert Hall. Tickets: $103, $78, $53. Sunday- See what some consider Bellini’s most famous opera. The musical tragedy, Norma, will be performed at 2pm in Concert Hall at Adelphi University. Tickets: $20. Click here to purchase. Sunday- Don’t miss the Bacon Bash at the Cradle of Aviation Museum. Enjoy tastings of bacon, bacon foods, bacon desserts, CHOCOLATE COVERED BACON and more! 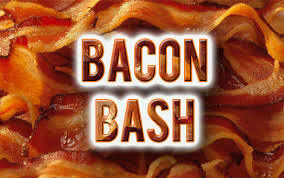 Bacon Bash is a family friendly event. There are four sessions on Sunday. Purchase tickets here.